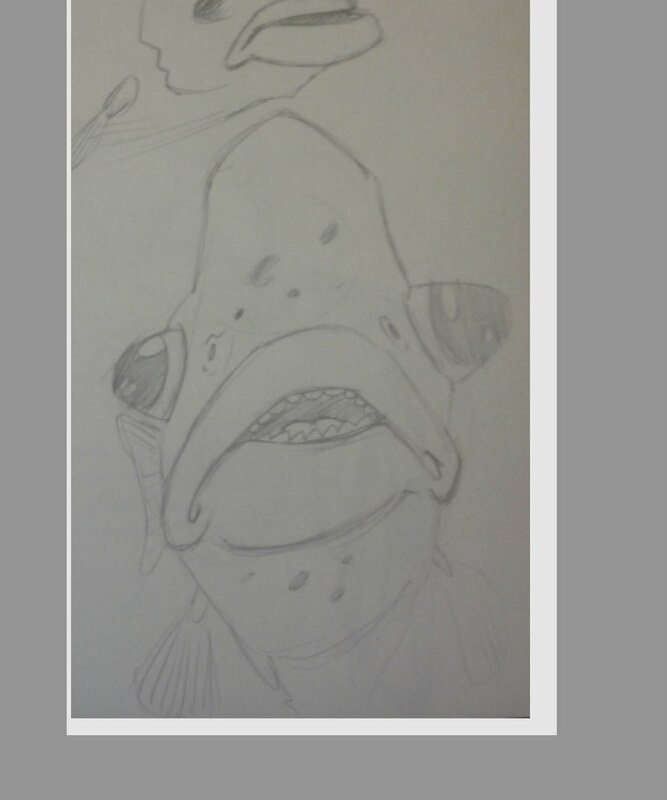 Drawings by Devin: I wonder where that fish did go? 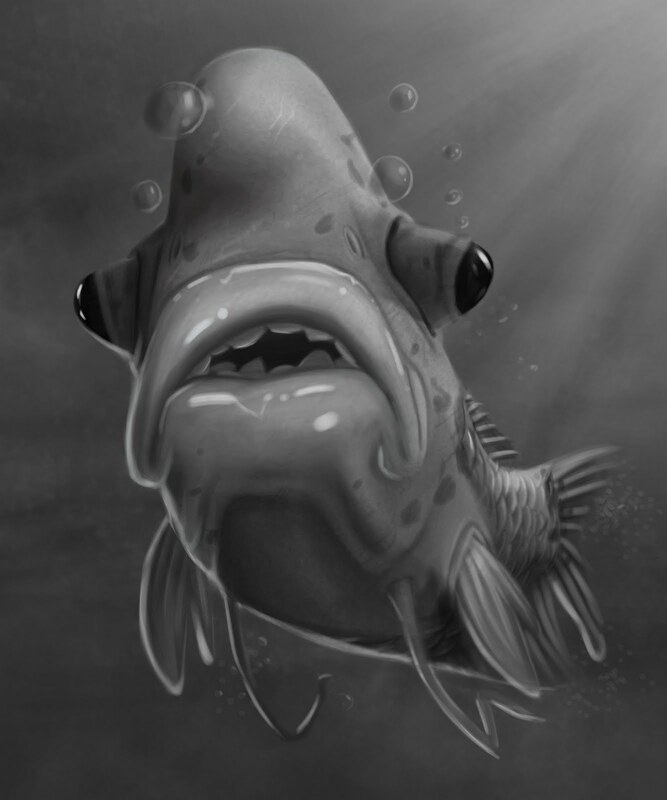 Here's a progress update on our first digital assignment this year: the fish. I was pretty excited about this one because I find fish to be fascinating animals. It's very difficult to imagine a creature that's wierder than some of those which come from the sea. As an added bonus, I drew some very fun fish during a trip to the zoo recently, and had a nice starting point to work from. 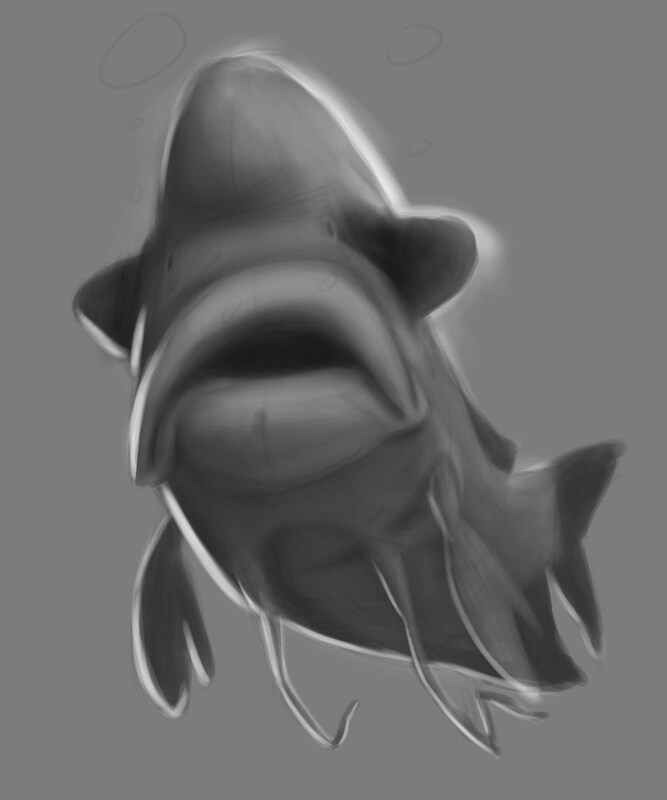 This was a quick sketch of a jumbo gourami which stood out to me. I liked the exaggeration of the fish's expression, but it's a straight on view, which wouldn't do for the assignment. Obviously there's some work to be done. Just using a basic flat/highlights/shadows layer composition to block in the forms of the fish. I gave the fish a slight three quarter, so now he's turning towards us. The basic light/shadow and forms are described well enough that I can flatten it and start working on one layer. 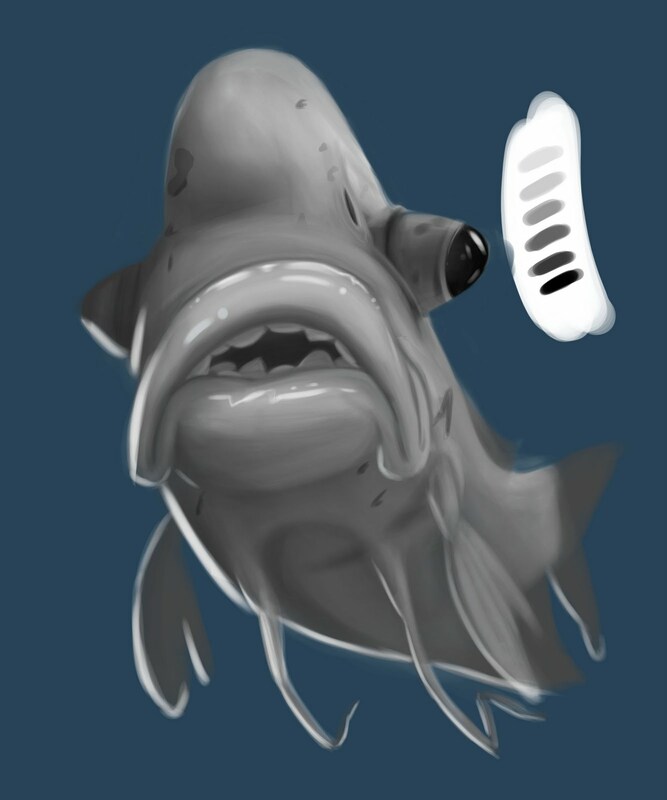 Here I've been struggling with the mouth/eye area, and it just isn't working in 3D. The mouth is off center with the rest of the head, and I have to re-adjust. I sleep on it first, though. I change the way the bottom lip connects with the belly (not for the first or last time), and try adding a divot to the bottom lip. 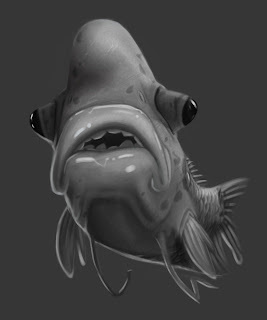 It's something that the fish in my reference photos have, but it's too distracting. 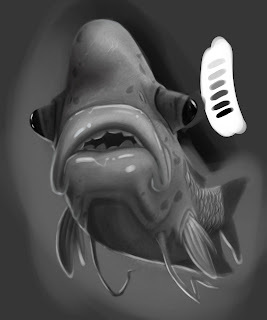 At this point, the Jumbo Gourami is more of a jumping-off point for my own fish design, and I worry less about losing it's "likeness". A few texture layers and some scales, and I'm on the home stretch. The scales look flat and unconvincing, though, and distract from the real areas of attention. I add a few layers of light and shadow to try giving the scales more depth, and also use the blur tool to tone them down. The fins are loosely painted and basically without texture so they don't compete for the attention. A quick background and some bubbles, and it's all finished. I like pretty much everything but the scales right now. I could go back in and fix them, attempt to make them chunkier and looser, but I'm not sure it's worth the time for a 5% assignment.